A maintenance log and note section; and much more! Written using clear, easy-to-understand terminology, the Guide is a companion to your owner’s manual (which contains the priority information on your vehicle’s specific make and model). 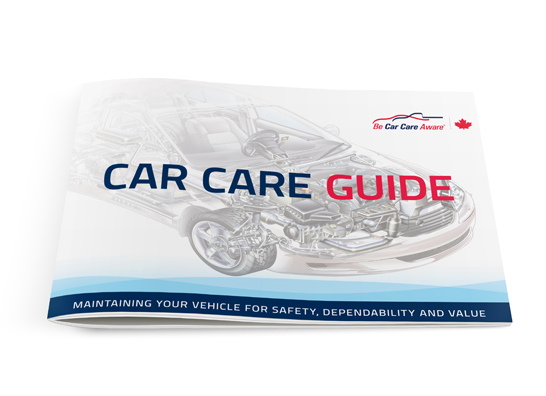 The Be Car Care Aware Guide is also available for purchase in hard copy through our e-Store and will be shipped directly to you. The Guide is a perfect gift for a new car owner and is a must-have for all your family’s vehicles. If you are a member of the aftermarket industry or are affiliated with an educational institution, please click here to learn more about purchasing the Guide in bulk quantities or in customized format with branding opportunities for program sponsors. The online version of the Guide is free, responsive and mobile-friendly so you can flip through it at any time from your home computer, smartphone or tablet. Click here to view the electronic version.